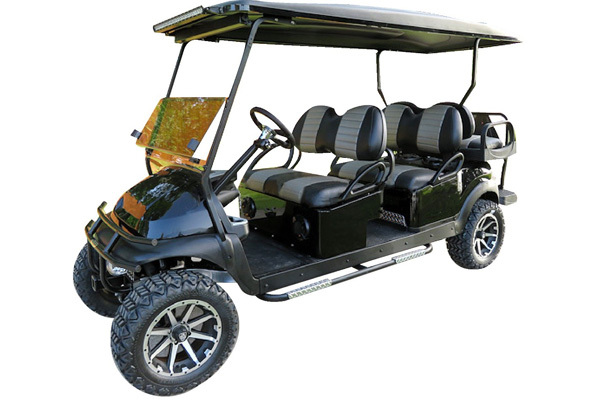 Custom 2015 Club Car Precedent 48 Volt 6-passenger golf cart with brand new Trojan batteries. Like all of our carts, it has had a fresh full reconditioning service. We’ve done a 6-passenger “stretch” limo conversion, and we’ve installed the following accessories: High-speed code (speed setting 4), High Torque/High Speed motor, new 4 gauge battery cables, 6″ USA-made A-Arm lift (for the smoothest ride! ), heavy duty rear leaf springs, 14″ Black Rebel wheels with 23″ Hammer tires, OEM style Black bodies and Black powder coated front seat pod, 112″ black extended top, unique USA-made Max 5 rear flip seat with safety bar, stainless hardware, rust-free black plastic footpan, and built-in combination ice chest/storage compartment under the seat! Ultimate LED light kit (includes LED headlights, LED taillights, LED brake lights, turn signals, emergency flashers and a horn), Sony 200 watt Bluetooth stereo, (4) Sony marine grade speakers, 800 Watt Powerbass amplifier, 10″ Rockford Fosgate subwoofer, antenna, auxiliary battery system with AGM battery to power the 12 volt accessories, new style black Sentry dash with matching silver trim inserts and large, locking top-loading storage bin, and stereo mount! Tinted folding windshield, black powder coated brush guard with built-in front hitch receiver, 32″ single row LED light bar mounted on the top front rail to light up the night, 5 panel mirror, new custom Black with Silver Wave hand-pleated seat upholstery, custom black steering wheel with hub adapter, custom made black powder coated nerf bars with diamond plate steps and slow moving vehicle (SMV) sign. This cart is sweet! We can add any or all of the following to this cart to customize it even further for you: rear seat cupholder/armrests, high amp controller, heavy duty solenoid, 4 gauge wiring throughout the motor/controller, your choice of color LED accent lights in the roof, dash and underbody, any Wetsounds stereo equipment, seat belts on any or all of the seats, 12 volt power points, front mounted ‘clays’ basket for more storage, gun racks, side-mounted LED light bars on the roof in various sizes, side-mounted mirrors, or anything else you can think of! Ask about financing and our extended warranty option! All of our carts include free Limited Warranty and 3 month maintenance package, applicable at our shop!